First of all, let me apologise for what must be the worst photograph of a soufflé in existence. 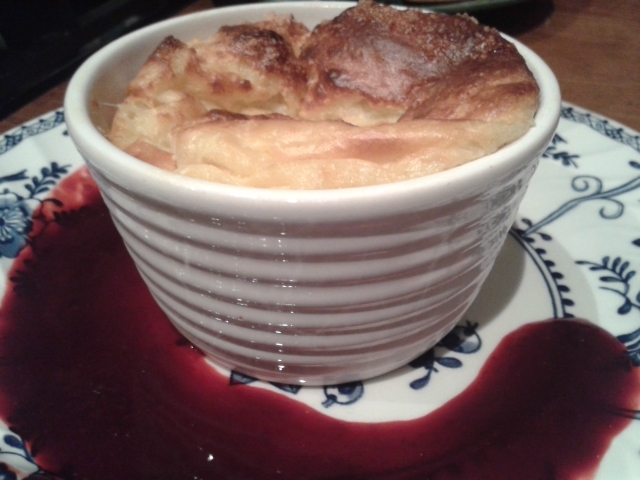 I still don’t have a proper camera after I smashed mine, the soufflé collapsed when I went to find my phone and the addition of the sauce makes it look like some sort of CSI crime scene. But trust me, it does taste really good! I came up with the idea for this recipe whilst I was on holiday in France. The shops and markets were full of hard sheep’s milk cheeses and one stallholder told me that they are traditionally eaten with black cherry jam. I took a jar away with me and it was an amazing combination, the saltiness of the cheese contrasting with the sweetness of the fruit and sugar. It got me thinking about British combinations; I tried Spenwood cheese for the first time a few months ago, a sheep’s milk cheese made in Berkshire and thought that it would go well with blackberries – so then I just had to wait for the blackberries to appear! It’s slightly different to the French combination, as the blackberry sauce is tarter than the jam but still lovely (it would be interesting to try with a blackberry jam). 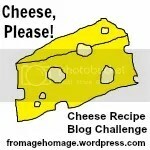 I’m especially chuffed with this recipe as I submitted it to a competition run by the cheesemongers La Cremerie during British Cheese Week and was delighted when it won (and I submitted it under my real name rather than my blog name so there can be no suggestion of favouritism – although I’m pretty sure if someone was looking for a blog to promote their products they’d pick a more popular one than mine ;)). Anyway, my prize was a selection of delicious British cheeses, which I’m looking forward to gobbling, cooking with and writing about. Preheat your oven to 200˚c / 180˚c fan-assisted / Gas Mark 6. Butter a large soufflé dish and put it into the fridge. You could also use individual ramekins; the mixture will fill 4-6, depending on the size. Melt the butter in a saucepan then add the flour. Stir until the mixture combines and then slowly stir in the milk, as if making a white sauce. 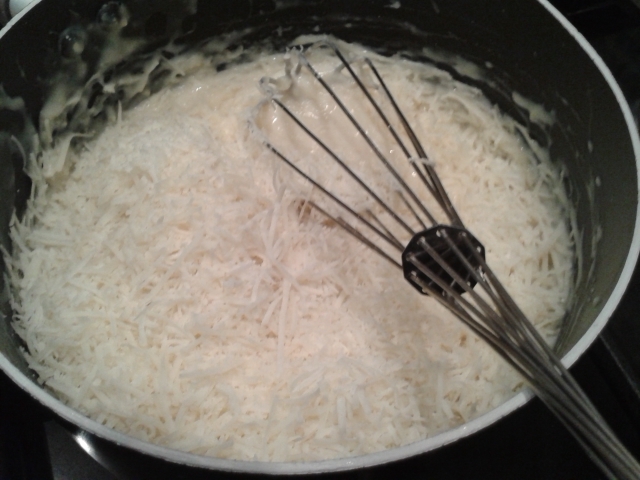 Add the grated Spenwood and continue to cook on a low heat for 5 minutes. Remove from the heat and add the beaten egg yolks to the mixture. Stir well to combine and season with salt and pepper. 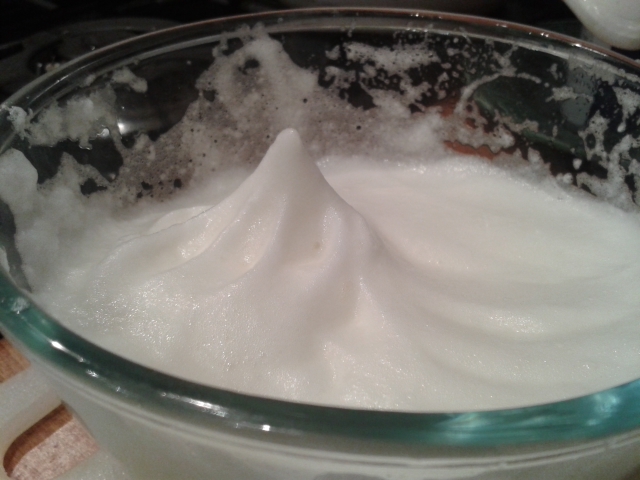 Whisk the egg whites until stiff and shiny then gradually fold them into the cheese mixture (the mixture should look bubbly if the egg whites are stiff enough). Spoon the mixture into the pre-buttered dish then bake in a preheated oven for about 30 minutes. To make the sauce, combine the berries with the sugar and water and cook gently for about 10 minutes or until the berries are soft. Mash the berries up with a fork and add the lemon juice. 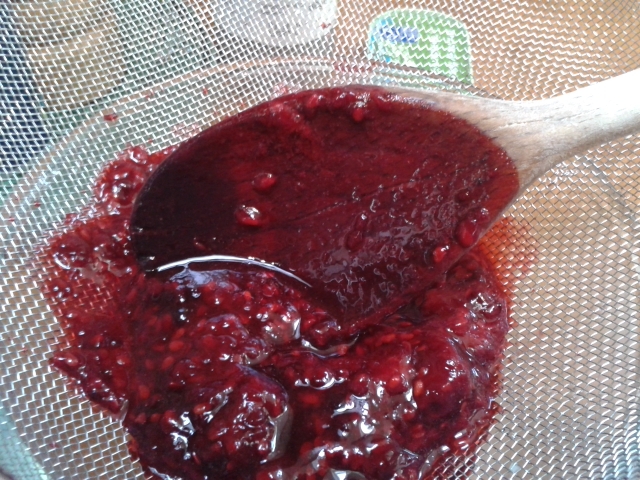 Press the berry mixture through a sieve to remove the pips and gently reheat in the saucepan. 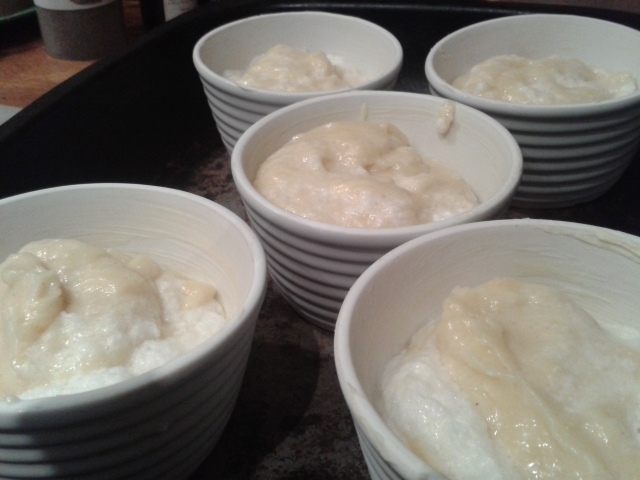 Remove the soufflé from the oven and serve immediately (in case it collapses like mine did in the rubbish photo!) with the sauce on the side. Because it contains hard sheep’s milk cheese, I’m adding this recipe to this month’s Cheese, Please! Challenge. CSI is one of my favorite TV shows and this sounds absolutely scrumptious! It’s a great combination, if I do say so myself. Really, really need to work on my food photography though – what a shambles! Thanks! Have you dreamt up anything for Cheese, Please! yet? Think I’ve scared everyone off by choosing hard sheep’s! I have and I went Spanish! I’ve been meaning to cook with manchego, and I managed to find some so I made two things… just you wait! It tasted a lot better! 😉 But thanks! Looks good to me! Yum! We actually make the Spenwood cheese here at Village Maid and really excited to try out your recipe. I’ve never had much success with soufflé but you make it sound so easy I’m gonna give it a try! If at first I don’t succeed there’s plenty more cheese in our store! 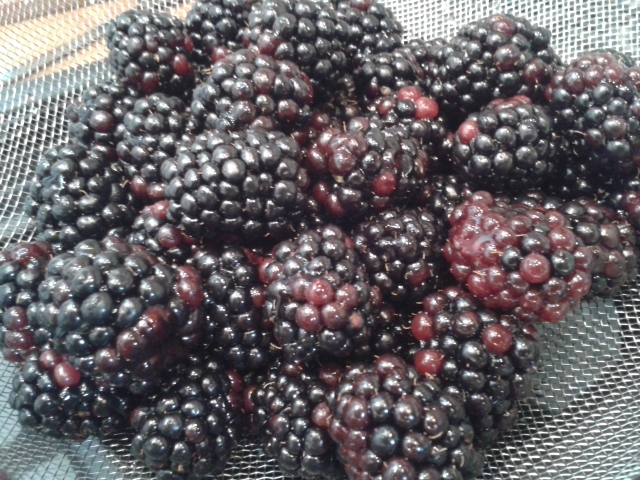 Great idea to try blackberries that are free at the moment. Thanks for supporting us and enjoying our cheese. My pleasure 🙂 This was the first soufflé I’ve ever made and I was a bit terrified. I’m not sure they’re supposed to collapse quite so soon but it still tasted great. I have visions of you running your store of cheese down now, desperate to make the perfect soufflé 😉 Love your Wigmore too.